TRD is proud to announce the latest innovation of its Anti-Drone Range of products during the DSA Exhibition 2018. 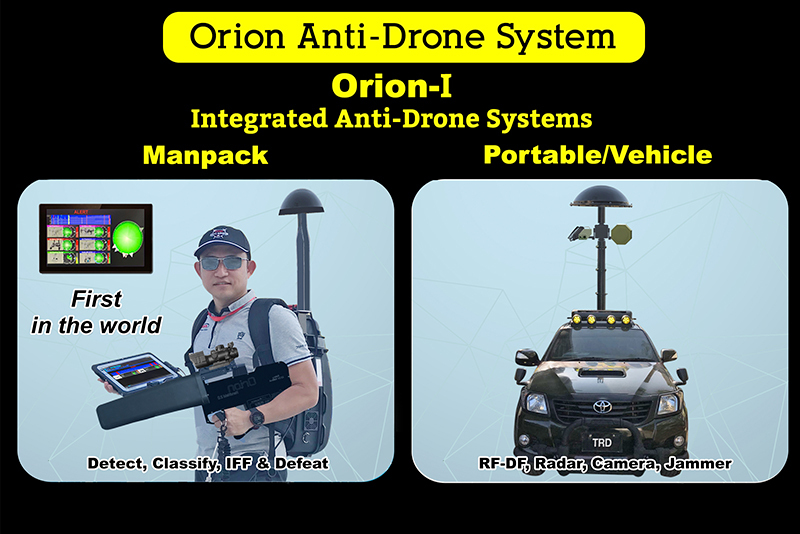 Taking centre stage, we will showcase the Orion-I Man Pack system that is equipped with drone detection and jamming capability, the first of its kind in the world. The Orion-I (MP) is a passive RF system capable of detect, classify, direction-find drones as well as identify friend or foe (IFF). It’s special feature would be the integrated selective jamming function where its able to bring down drones effectively and quickly. This would be the only light weight portable 2in1 machine that is available in the market. At the same time, you will be able to discover our upcoming new development of full integrated system consist of RF Direction Find with Camera and Radar configurations for fixed and vehicular applications. In addition, a series of product such as recently launched (Singapore Airshow 2018) Orion-H, a super light-weight (< 3kg) Handheld Anti-Drone Jammer with new improvements. Our reputed Orion-7 Man Pack jammer Gun that is already being used in more than 10 countries will be on displayed as well. TRD will have a “LIVE” Demonstrations of the Anti-Drone System scheduled on 18th April, 2pm located at Level 3 loading Bay. Do join to witness the true capability of countering drones with Team ORION!